From the moment your family and friends first turn into the grounds of Fonmon Castle, they will realize that they have arrived somewhere very special. An 800 year old home, set on a private estate in the beautiful Vale of Glamorgan, just 25 minutes from Cardiff and the M4. •	Fonmon caters for all style of wedding ceremonies and receptions and each event is uniquely tailored. 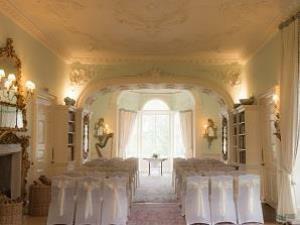 •	Stunning castle with its Georgian interiors can be used alone or with a marquee for larger celebrations. •	The Castle welcomes guests into a warm, friendly atmosphere where our experienced team is on hand to make your day perfect. This romantic castle, situated in the Vale of Glamorgan just 35 minutes from Cardiff and the M4, is yours exclusively for the day and makes an ideal setting for the perfect wedding, large or small.